Watermarks are an easy way to stamp your authority on a particular document and image. Watermarks do not look good and readers or viewers like to see the original document or image rather than the one with watermark. However, watermarks are a good way to deter unauthorized distribution and give you an opportunity to get the due recognition. 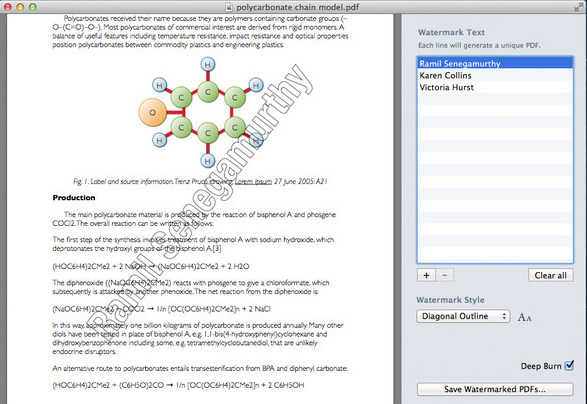 If you’re a Mac user, it is very easy to create watermarks in PDFs and images. Bronson Watermarker is a Mac app, which makes it easy to create personalized watermarked PDFs and images. Whether you’re sending out one file or 100, each will be labelled with the reader’s name. You can customize your watermarks by choosing font, color and opacity and give it a true identity. Other watermarking apps force you to generate each file separately — which is both time-consuming and error-prone. With Bronson Watermarker, a simple list of names can generate any number of individually-watermarked PDFs or images with a single click. It’s easy-to-use, fast and foolproof. Bronson Watermarker is available in Mac Appstore.